This month, we got some more hands to help from Our Lady of the Lake with Ashley Kosier and LSU with Morgan Walker. Ashley is a pediatric resident and Morgan an Internal Medicine Resident. 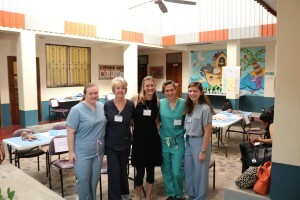 Both residents helped us in the Midwife Conference and participated on brigade with CityHope’s medical team. They even got to experience a rotation in La Ceiba’s hospital! They both helped us with after-hour emergencies at the Jungle Hospital, which seem to become more and more common during the chaos of the summer. Our emergency patient, Doña Paula, benefited from Morgan’s palliative care. We hope to host even more residents as the years go on through our relationship with Our Lady of the Lake Hospital!